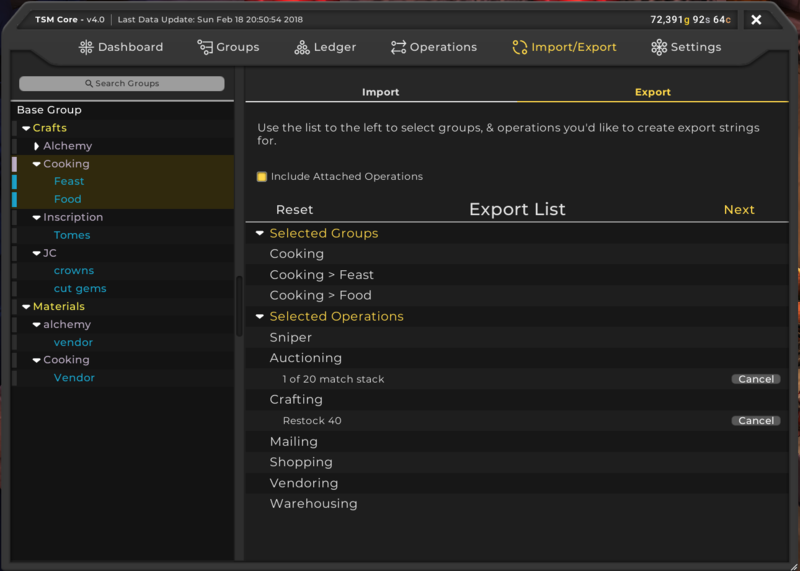 The Ledger section in TSM4 has been in it’s temporary TSM3 placeholder mode until now. We’ve done a lot of work on the section and are proud to share with you the progress we’ve made on the powerful new tool that became of Accounting. The three updated sections you will find in the new Ledger are Revenue, Expenses and Failed Auctions. You will find they feel similar to their TSM3 counterparts, but with the much better look of TSM4. You’ll find that the Inventory viewer isn’t finished yet. We hope to bring it to you soon. Until we do, we hope that you explore the Ledger update, and let us know what you think. 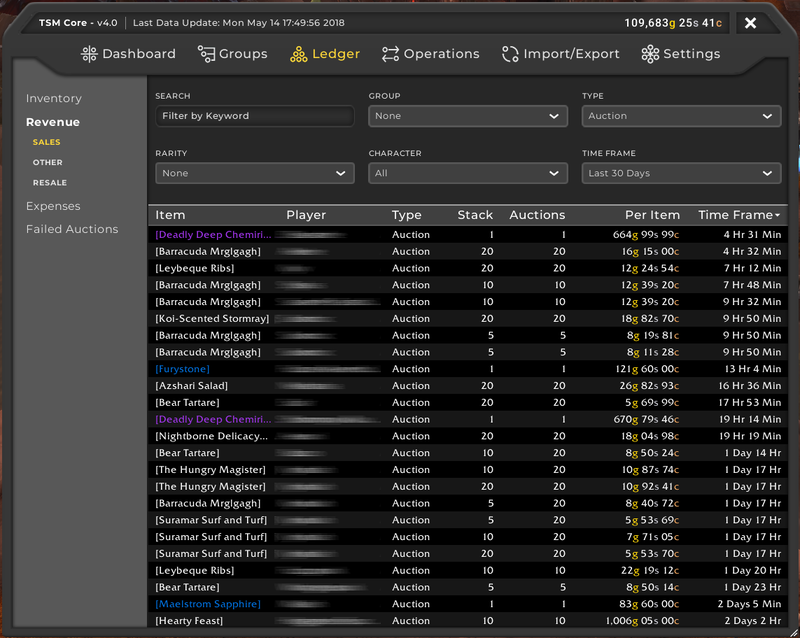 Hopefully you are as excited about the changes we are making to the Ledger in TSM4 as we are. To give these changes in the hands of more goblins as soon as possible we are also sending out a massive new wave of TSM4 beta invites every day this week. If you’ll be one of the lucky goblins joining us in the TSM4 beta, you’ll receive an email from us at the address associated with your TradeSkillMaster account. In this email, you’ll also find a link to an article on our knowledge base that explains how to setup your TSM app to access the beta and how you can join the #beta channel on discord, which is the dedicated place for feedback and questions pertaining to the TSM4 beta. If you’re not already signed up, go ahead and sign up for the TSM4 beta here. If you like what we do and would like some extra functionality, please consider becoming a TSM premium user. It includes priority access to all of our betas, including TSM4. Come join our Discord now! The /r/woweconomy & TSM Discord is growing every day. We’re both incredibly flattered by and proud of the fact that there are now over 23 thousand users. Whether you’re only there to check prices once in awhile, partake in every discussion eagerly, or anything in between, thank you! If you’re not yet familiar, there are many reasons why you should make the effort. Firstly all TSM support happens in channels dedicated to this purpose. TSM3 question go in the #tradeskillmaster channel, and any issues specific to the TSM4 beta are handled in the #beta channel. There’s various channels available in the general discussion section too. Here you can discuss your goldmaking methods, or share that neat snipe you just bought! Don’t be afraid to talk with others, try to pick the best channel, and enjoy being a part of this ever growing community! If you’re only looking to be kept up to date on the latest important news, there is a #news channel for that specific purpose! Large TSM updates, important Blizzard news and particularly important TSM news gets shared in there to offer you a central place. In short, The /r/woweconomy & TSM Discord is becoming ever larger. It’s got a little bit for everyone, and you too should be a part of it. If you’re still not entirely convinced, simply join and see what you think. There’s even more channels and ways to communicate than just what’s mentioned here! The TradeSkillMaster team is a small group of gamers who love to learn new skills and constantly push the boundaries of what TradeSkillMaster can do for our users. What started as a small addon has grown into a suite of powerful addons, a desktop application, and an extensive set of web-based tools and resources. We are driven by self-improvement and creating a great set of products and services for our users, while working in an efficient, but laid-back environment. At TradeSkillMaster, we always strive to improve the products and services we offer. To that end, we are looking for a passionate addon developer to work on adding critical new functionality to our in-game addons which are used by hundreds of thousands of people. As a part of this role, you will be expected to work closely with other members of the team to implement exciting new features, constantly improve the overall quality of our codebase, and improve the general stability of the addon. This position is specifically for somebody who would be working on the TSM addon (TSM4) 25-30 hours a week. Therefore, the ideal candidate would be an independent contractor (potentially with other, smaller workloads), and not somebody with a full-time job. The work would be purely remote, and there are limited requirements on location, but roughly NA/EU timezones are preferred. Ready to join us? Send me (Sapu) a message on Discord (https://discord.gg/FJ4877H – if I’m AFK I’ll respond ASAP) or send me an email (sapu94@gmail.com). Come prepared with your resume and any questions about the role you may have. This is another very technical blog post which provides a look into the new database library which has been added to the TSM codebase with TSM4. This is an internal code library which makes it easier for us to implement new features in TSM4. This new database library is made possible by the class library which I discussed in a previous blog post. New TSM4 Beta Version and Invites! The TSM4 beta is always evolving and today we have some updates to share with you. We’ve been working hard to get TSM4 closer to release. While there is still a lot of work to be done, we’re excited to share our latest progress. There are a few big new features that we’ve been focussing on and will go through in this blog post. This will be a very technical blog post which provides a look into the new class library which has been added to the TSM codebase with TSM4. This is an internal code library which makes it easier for us to implement new features in TSM4. This new class library is the base for many other internal code libraries in TSM4 such as our UI Builder, Database, and FSM libraries. We will go into more detail on the other libraries in future blog posts. If you haven’t yet received an email inviting you to the TSM4 beta, then that doesn’t mean you can’t see it in action. There are many people who stream their goldmaking activities, and some of them have beta access. If you don’t have a favorite streamer or community person, we’ve included a list of our affiliates here. Hopefully between them you’ll find someone to your liking! For those of you who’d prefer to listen to one of TSM’s own team members, Gumdrops regularly streams his goldmaking and answers any questions people have about TSM, including taking a look at new versions of TSM4 as they are released. Be sure to go check out his streams if you’re interested! If you want to ensure you get into the beta as soon as possible, you can go ahead and sign up for an invite here. If you like what we do and want to support the continued development of TradeSkillMaster and also get priority access to all of our betas, please consider becoming a TSM Premium user. In this blog post, I will be giving a behind-the-scenes overview of the new deployment system we have created and been using throughout the development of TSM4. Why did we create this new deployment system? The TSM Team has been hard at work for a very long time to bring you the TSM4 beta. We wanted to give you some technical insights on what goes on behind the scenes. Today we’ll be taking a closer look at the Design of TSM4. H3ggers will be joining me to answer some questions! I asked him three questions, and he’s been so kind as to offer detailed answers to them. On a high level, what goes into setting up a UI from the ground up like this? How much of the old UI gets taken into account, and how do you decide what is best from a user experience standpoint? The TSM Team will attend Blizzcon this year! We’re thrilled to be going, and can’t wait to meet everyone. While some TSM Team members have met each other in person, this will be the first time most of the team will be in one place. We are also extremely excited to meet all of you and talk shop about all things TSM and WoW gold making! Read on to learn more about what we’ll be doing during Blizzcon and where you can meet up with us in person or online. Patch 8.0 updates and TradeSkillMaster 4 Release Date!